One of the strangest things to me about any controversy regarding defensive shifts in baseball is that every team I’ve ever played on since I was 8 (mostly softball, admittedly) has shifted based on familiarity with the hitters on the other team. Of course, that doesn’t mean mistakes don’t happen, but if you knew a batter tended to hit a ball in a certain spot, you always shaded that way and dared him to beat you in another spot. If he did, tip the cap. But at least they had the burden. If you knew where a batter tended to hit and you didn’t move to cover that spot, that would be bizarre. 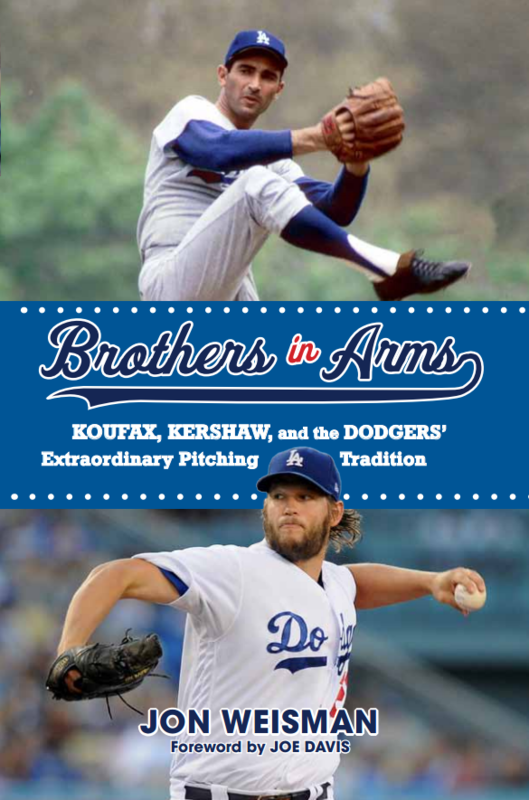 It would be like knowing that a batter liked fastballs in … and continuing to throw fastballs in. 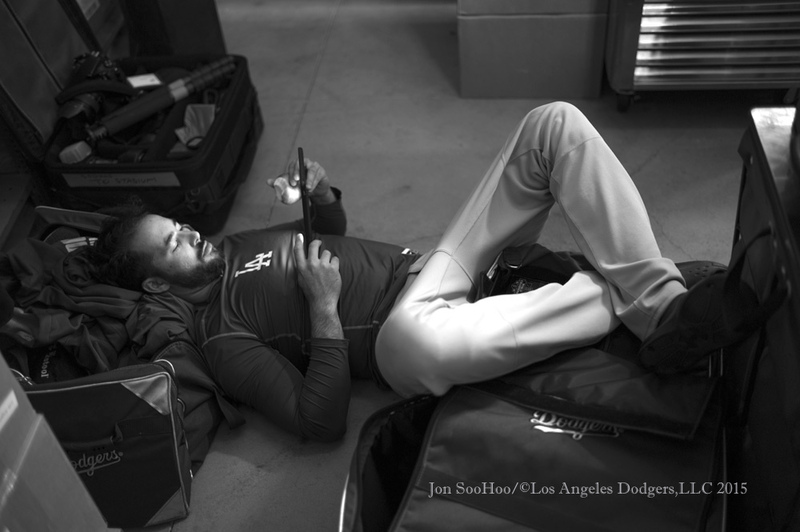 Three sighs, and the Dodgers were out. Adrian Gonzalez is hitting like a man possessed in his first two games of 2015 and Zack Greinke was practically untouchable in his season debut, but the Dodgers are 1-1, thanks to a three-error performance by their defense tonight that figures to be uncharacteristic. After a 30-minute rain delay, San Diego topped Los Angeles, 7-3, scoring its first four runs thanks to shortcomings by the Dodger defense. Racing in on a wet outfield, Carl Crawford’s diving attempt failed to corral Justin Upton’s sinking liner in the first inning, allowing it to scoot past for an RBI triple. Padres 1, Dodgers 0. Jimmy Rollins lost his balance while backpedaling for a seventh-inning Yangervis Solarte pop-up, dropping the ball to allow Yonder Alonso to score. Combined with a second-inning miscue on a grounder, it was Rollins’ first two-error game since August 10, 2010. Padres 2, Dodgers 2. With two on and one out and in the top of the eighth, Will Middlebrooks flied to Yasiel Puig, who caught the ball flat-footed. Derek Norris tagged up and went to third base, then scored on an Alonso single. Padres 3, Dodgers 2. In the ninth, after Clint Barmes singled, Cory Spangenberg reached base when Yasmani Grandal bobbled his bunt and then made a desperate throw into Spangenberg’s back. Barmes advanced to third, then scored on a single by Wil Myers. Padres 4, Dodgers 3. The Padres would tack on three more runs to effectively put the game out of reach. San Diego won by four, scoring three unearned runs, plus the first inning tally that was questionably if officially earned. 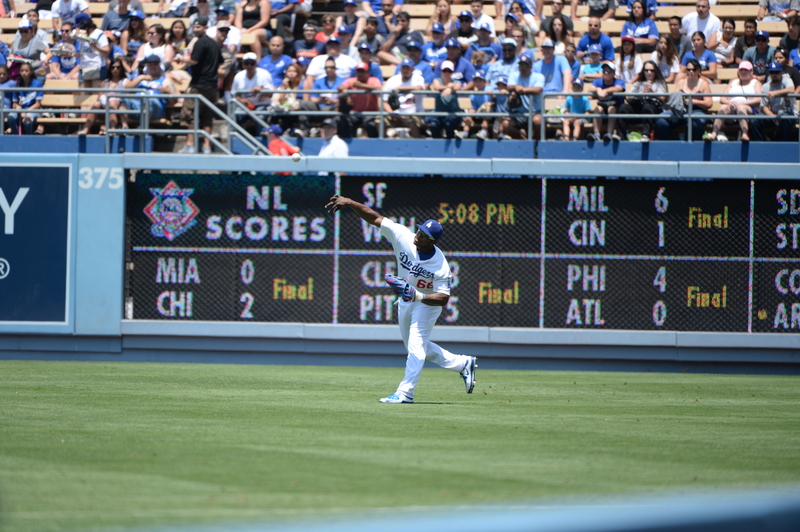 Puig, as he so often does, recovered from his setback in impressive ways, making a difficult catch of a foul by Upton for the second out of the ninth. 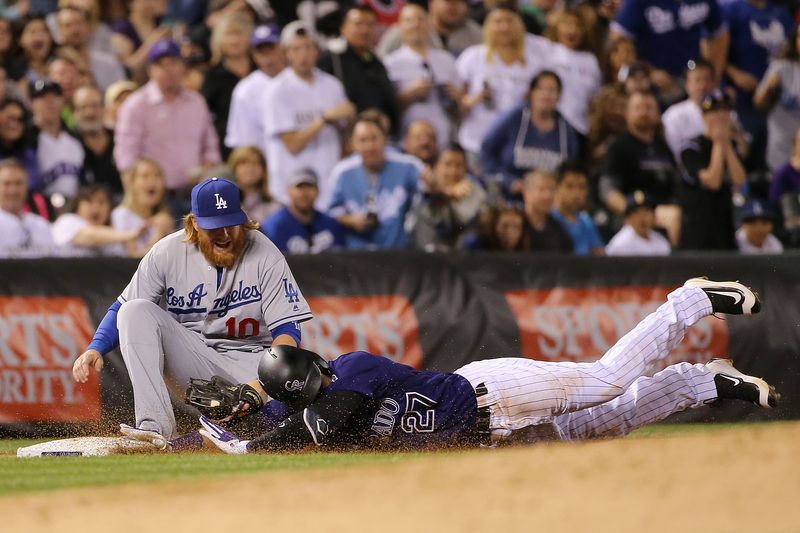 And the Dodgers were twice resilient, rallying from 1-0 and 3-2 deficits before the dam burst in the ninth. Leading the way was Gonzalez, who became the first Major League player since Ray Jablonski in 1956 and second ever to have a single, double and home run in each of his first two games of the season. Gonzalez is 6 for 9 with a hard liner to third in his first at-bat of 2015. His sixth-inning double and eighth-inning homer each tied the game. 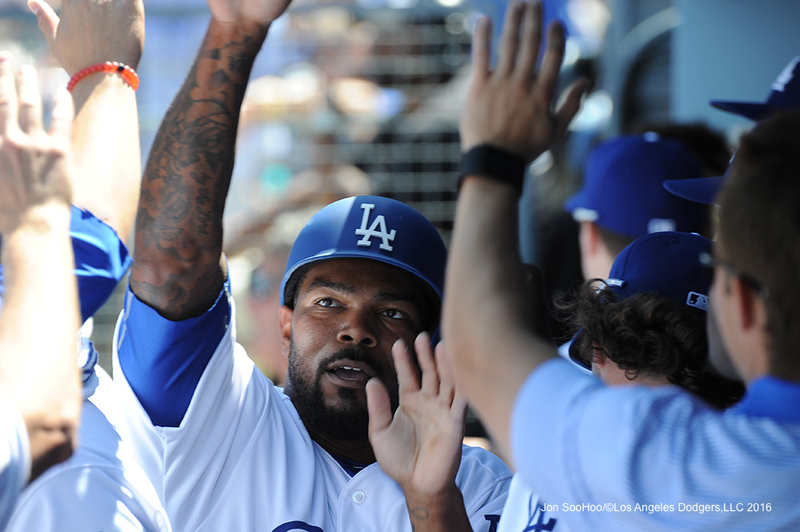 The Dodgers’ eight doubles in their first two games also ties a Los Angeles record set in 1995. Deuces wild? Adrian Gonzalez has two singles, two doubles and two homers (and two strikeouts) in two games. 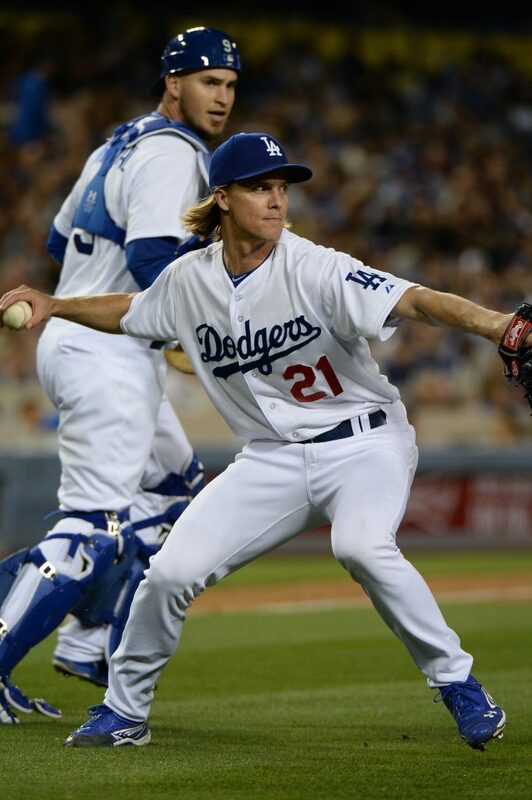 On the mound, Zack Greinke was fairly mesmerizing. After allowing a two-out hit to Matt Kemp in the first before Upton’s triple, Grienke held the next 18 Padres hitless with one walk. The bullpen didn’t fare nearly as well, with six relievers combining to allow nine hits over the final three innings. 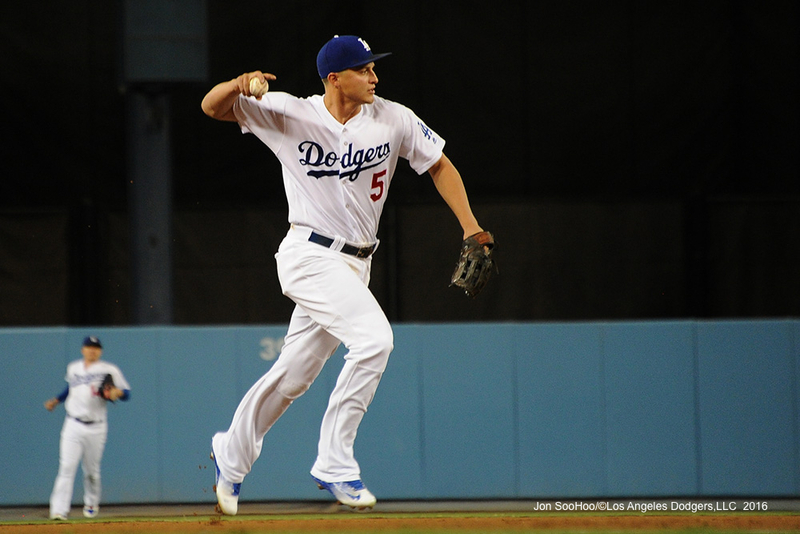 Young shortstop Corey Seager turns one of two double plays in Saturday’s 5-5 tie with the Indians, as Erisbel Arruebarrena stands by at second base. 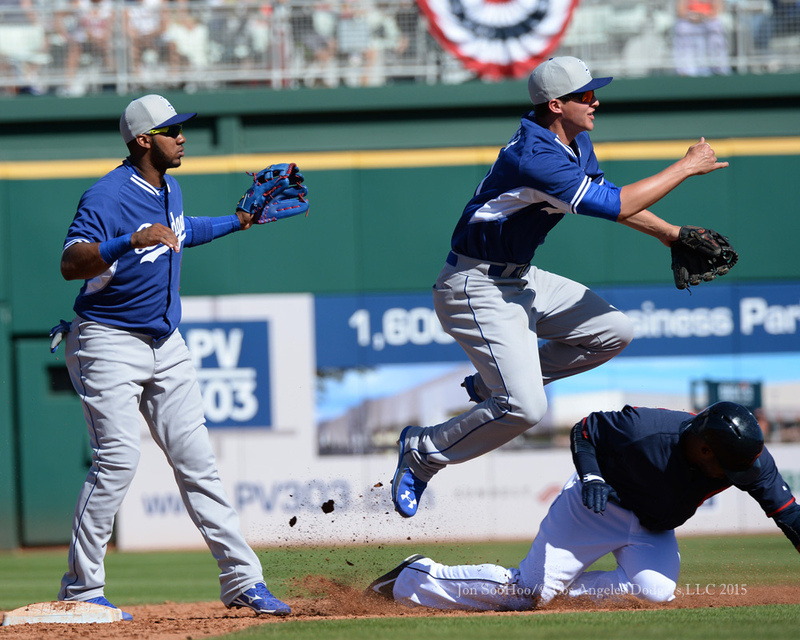 Some strong up-and-down hitting and exciting pitching performances have grabbed the early spotlight for the Dodgers in Cactus League play, but there’s another pleasing small-sample development to note. In 45 innings so far, the Dodgers have made only one error. 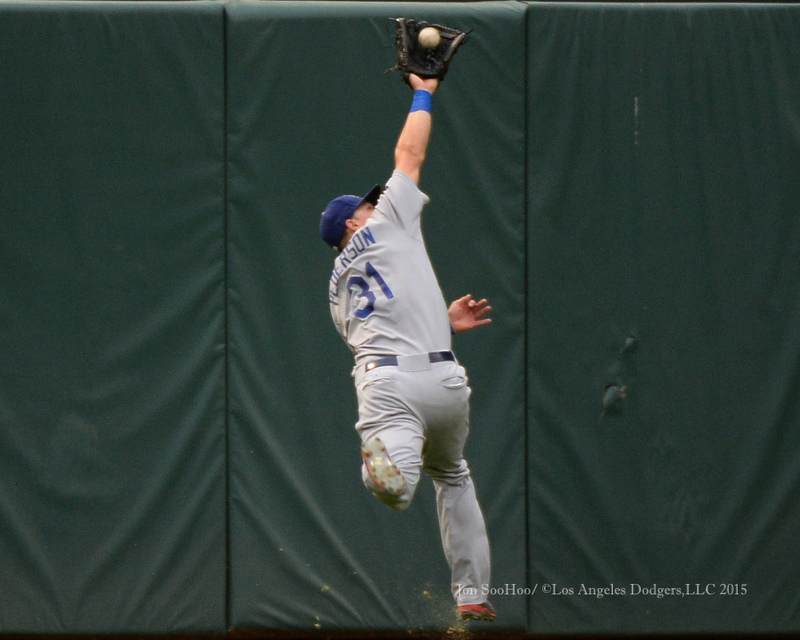 Errors aren’t everything — you also want to make more of the plays that don’t count as errors — but in general, the first five games give you a hint of what it means for the Dodgers to have increasingly valued in defense in 2015. 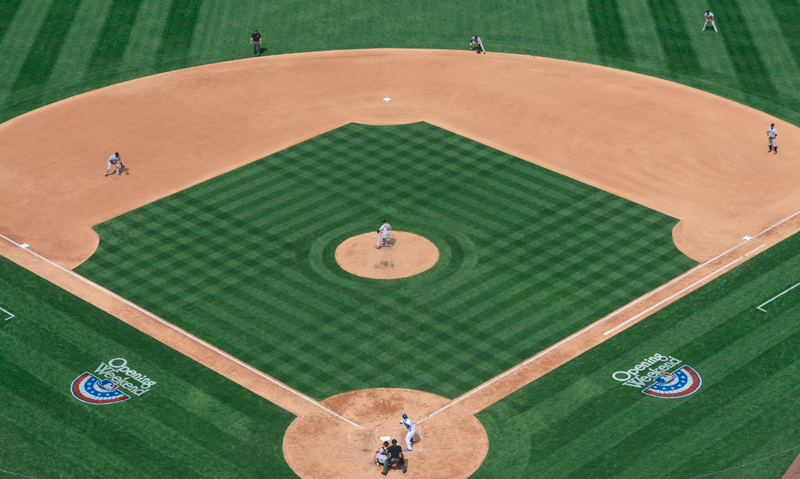 Fewer errors misplays mean fewer runs and fewer pitches. If you’re looking for a more advanced small-sample barometer, there’s this: According to MLB.com, the Dodgers currently are No. 1 in baseball in Defensive Efficency Ratio. So who made the error? It was former Gold Glover Darwin Barney, playing shortstop on Thursday rather than his usual second base. 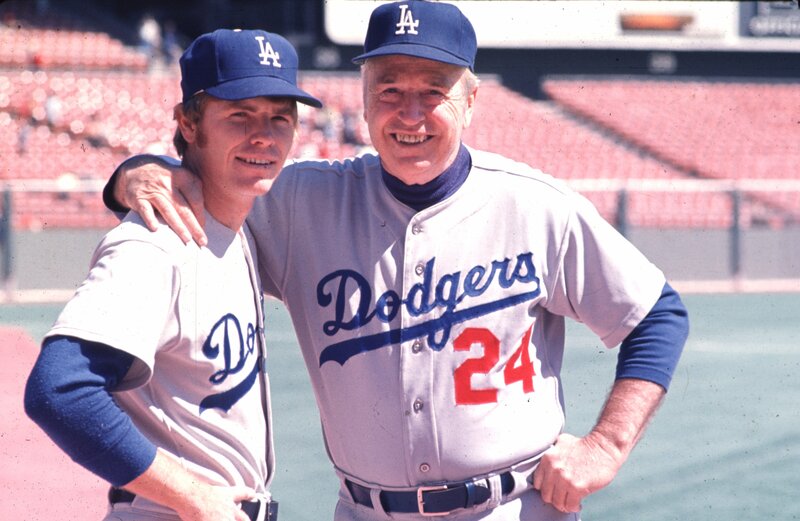 Twelve players in Dodger history have played both catcher and second base. Ten have played catcher, second and third. 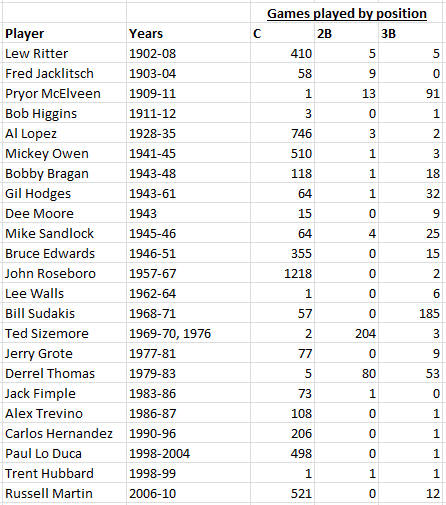 No one in Dodger history has played more than 10 games at catcher, second base and third base. Only Derrel Thomas has played even five games at all three positions, and Thomas was truly an emergency catcher. 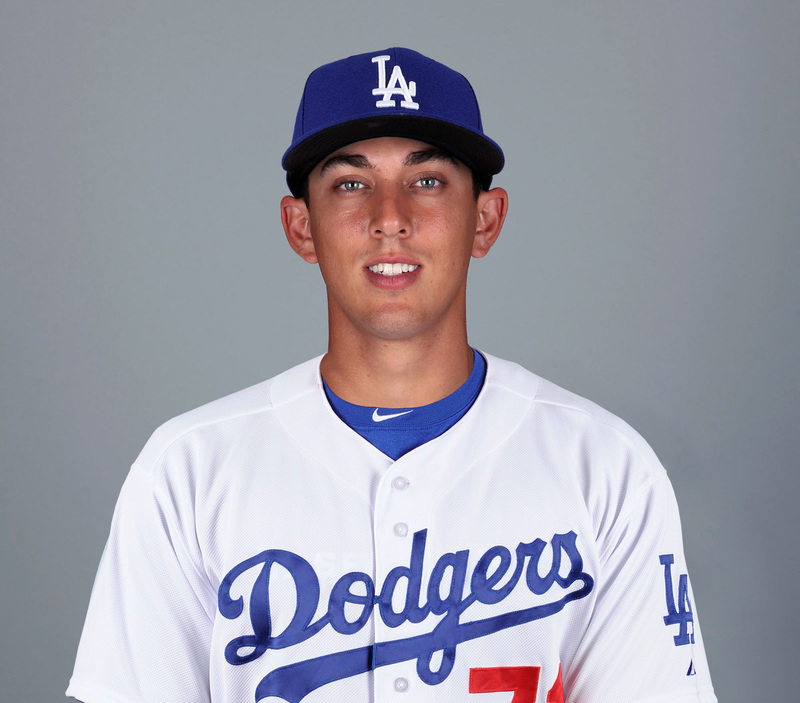 Austin Barnes, who came to the Dodgers from Miami in December, has the chance to carve out a unique place with the franchise.